Taking a break from my usual marketing-specific topics to do a review of a technology and wisdom conference I attended Feb. 14-17 called Wisdom 2.0 in San Francisco. The conference was about exploring the intersection between technology and wisdom, with leaders from Google, Facebook, Linked In and other tech companies with mindfulness leaders such as Eckhart Tolle, Jon Kabat-Zinn, with a sprinkling of leading scientists in neuroscience. It was quite a mix. Lots of good lessons, ideas and conversations from some of the world’s leading minds. * Arturo Bejar, director of engineering, Facebook – They are doing a lot to counteract online bullying via Facebook, analyzing people’s responses to pictures they find offensive and providing tools to facilitate those conversations. They are working with the Greater Good Science Center at UCBerkeley, a great organization headed by Dr. Dachner Kelter. I’ve learned about his work via my coaching work and they are doing very interesting stuff at Facebook, giving them a pretty large and dynamic sample size! Biggest surprise: Love is the most commonly expressed emotion on Facebook. * Vivienne Harr, founder of Make A Stand Lemon-aid – She has two products on the market, has helped twitter ring the bell for their IPO and is currently looking for investors so she can continue to expand. She has already raised over a million dollars to end child slavery. She’s 11 years old. * Lisa Kristine, humanitarian photographer – I am a huge fan of Lisa and her work. She was spectacular, as always, talking about the importance of presence, and how she frequently sees this in her work and the people, she photographs. Check out her work, and her current project to end modern slavery. This work is what inspired Vivienne to start her Lemon-aid business. * H.E. 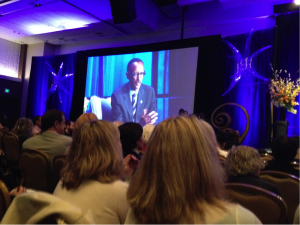 Paul Kagame, president of Rwanda – talked about the role of tech in the recovery of Rwanda following the massive genocide the country experienced. Surprising fact: The Rwandan government is about 60% female. * Jon Kabat-Zinn, author and mindfulness teacher – led an awake group meditation “without an end” and talked about the science behind meditation. Takeaway: The deep attentiveness of meditation need not stay on the cushion. * Ingoma Nshya, first ever Rwandan women’s drumming group – fantastic drumming performance, full of life and energy. They had a great video that introduced them and told the story of how the group was started as a way to heal communities after the 1994 genocide, where 70% of the country’s Tutsi population was killed. Takeaway: Women have a very important role to play in healing communities (even those divided by genocide). * ImprovHQ – learned the five tenets of improv (such as fail gracefully, make your partner look good, and listen fully) through fun, interactive improv exercises. Takeaway: Celebrate failure (that is a whole new concept for me!). Next week I’ll share insights from Arianna Huffington, Eckhart Tolle and leaders from salesforce.com, Facebook and Intel, among others. In the meantime, which of the above inspired you the most?